67024 departs with the boat train from Western Docks through Millbrook, 8th November. Image by Ian Knight. 08575 is a survivor from Scotland originally allocated in June 1959 as D3742 to Edinburgh Dalry Road (64C) then to St Margarets (64A) by April 1960 and upon 1965 shed closure to Haymarket (64B, HA) , my first noted sighting for this locomotive was at the "Edinburgh Rail Festival" of 24th September 1977 at Haymarket. In the mid 1970s, the locomotive was still vacuum braked only, and it was overhauled in this condition (Design Code 08-0 DV, 90 volts electrics, dual exhausters) at Glasgow Works in August 1980, continuing to work around Edinburgh. However it was stored sometime between 1981 - 83, then briefly reallocated to Eastfield (ED) and stored, Gateshead (GD), and sent to Swindon Works. Conversion then followed to dual brakes at Swindon completed in October 1985 (08-0 EX), allocated to Thornaby (TE) 1 2, later to Neville Hill (NL) around 1992, and Tinsley (TI) around 1994. 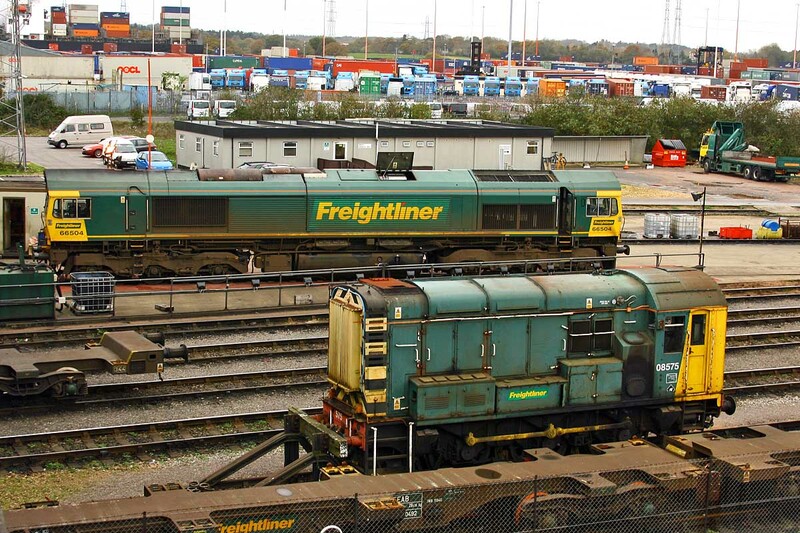 It had reached Millbrook by 1997, and has circulated around the Freightliner locations. 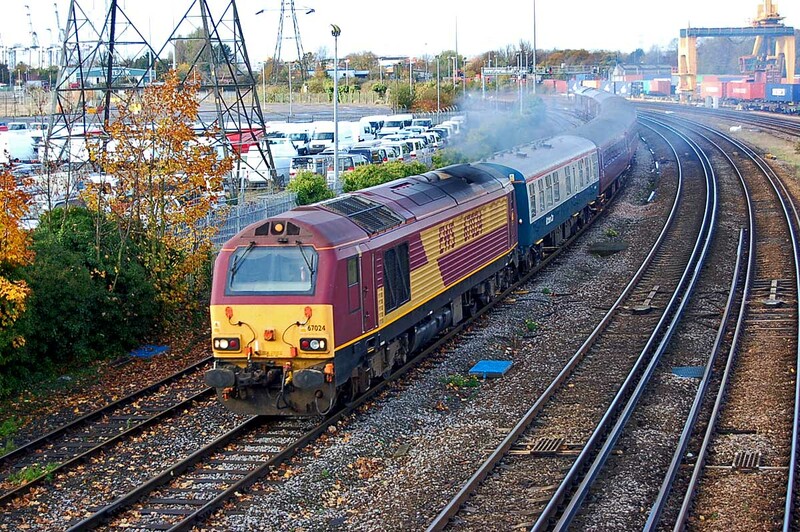 Reported at Bristol Barton Hill in March 2004 for TPWS fitting. Friday 12th November: 67025 5Z94 23:10c(Thu) Victoria - Eastleigh, 73207 + 73213 6G20 05.10 Romsey - Eastleigh failed Laverstock, assisted from rear by 66606 from Maritime, brake problems at Dean, arrived Eastleigh by 09:40.